Since 2000, member of the Ukrainian Artist Union. 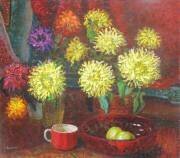 Major works: "Sun Flowers", "Still Life with Samovar". Author of many portraits. His work conveys the unique beauty of Ukrainian life.